The Treasury market’s inflation forecast has remained fairly steady since May, hovering in the 1.5% to 2.0% range. As of Monday’s close, the current outlook for inflation is 1.80%, based on the yield spread between the nominal 10-year Treasury less its inflation-indexed counterpart. As our chart below shows, this stability follows a period of extreme volatility, launched last September when the implosion of Lehman Brothers (NYSE:LEHMQ) sparked a steep wave of selling in almost everything, government bonds being the leading exception. The Treasury market’s 1.8% inflation outlook contrasts with the most-recent 12-month change in the headline consumer price index, which dropped 1.5% for the year through August. But if we look at core CPI, which excludes the volatile energy and food sectors, prices rose by 1.4% for the 12 months through last month. That’s just under the 1.8% inflation forecast implied by the Treasury market. If future inflation for the next decade lives up to the current forecast, the pace of consumer price changes will compare well with the historical record. A world where inflation resides under 2% is favorable if we use the long-run past for comparison. 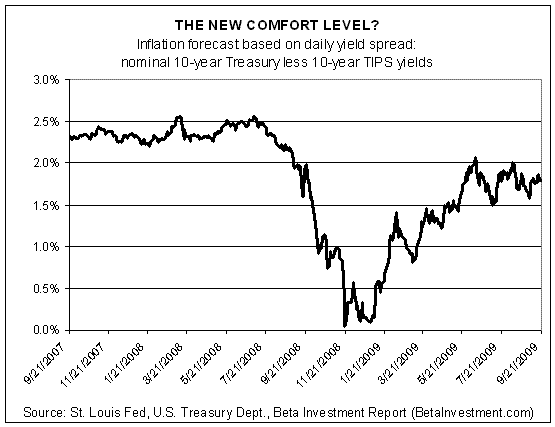 But inflation expectations aren’t a constant, which works well since inflation isn’t set in stone either. And therein lies the potential for mischief making. Such concerns will no doubt be on the agenda of the Fed’s FOMC meeting, which begins today and concludes tomorrow. For the moment, however, the market expects that the central bank will keep monetary policy on an even keel, which is to say maintaining its Fed funds interest rate target of 0-0.25%. As our second chart below illustrates, Fed funds futures project rates will stay unchanged for the next few months, rising slowly in 2010. 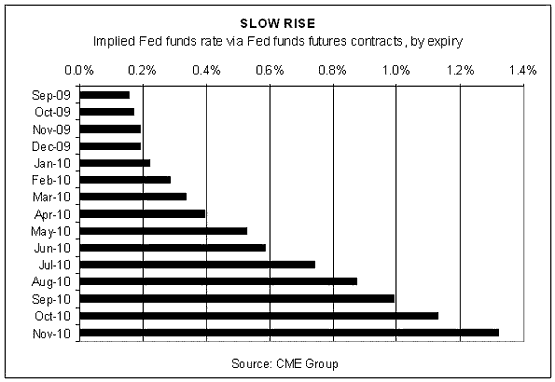 If the futures market is correct, a year from now we’ll see Fed funds at roughly 1.0%. It all makes for a wonderful outlook. Inflation is low and expected to stay that way, save for a s-l-o-w rise in the months ahead from an extremely low base. As inflation projections go, this is about as good as it gets. And that’s what worries us. But for now, all’s well. Enjoy it while it lasts.